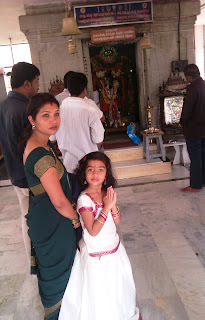 This is a Ugadi special post - the festival that fell on the 23rd of March. Maharashtrians call it Gudi Padwa, Sindhis - Cheti Chand, Manipuris - Sajibu Cheiraoba & Punjabis - Baisakhi. Hindus believe that Brahma started creation on this day. "Yuga Adi” means 'the beginning of a new age'. This has been a beginning of sorts - for me at least. 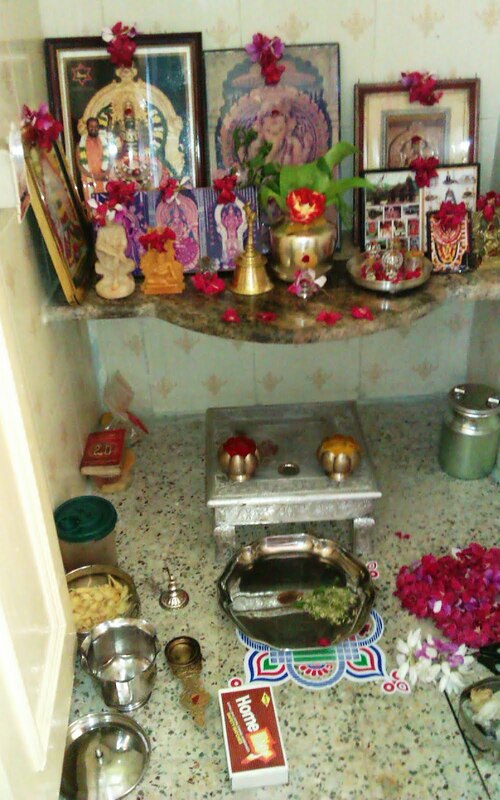 In the South, the first Ugadi immediately after marriage is a very important one. Ours came after 6 long years! Here’s a snapshot of our celebration. Whoever has read ‘A Regret’ would know why I am writing this post. This is a promise kept! 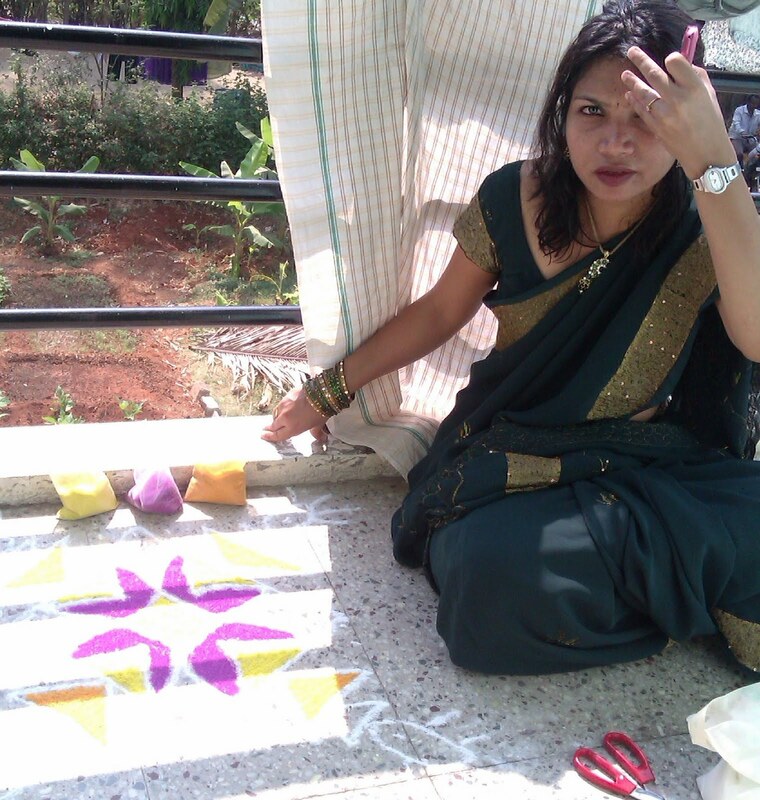 & immediately after that I set off on my mission to draw the first ever rangoli of my life! Here's the final cut - the fruit, err, design of my labour: Tanvi proud of her mother's once-in-a-lifetime burst of creativity!! Why do we eat that? To show that life is a blend of different experiences & all of it must be accepted with the same grace throughout the New Year. I have to mention here that up until this point of eating the Bevu-Bella at around 11 a.m, I had eaten nothing since the time i woke up which is again a FIRST for me!! Then my mother-in-law & I got busy with preparing the feast – Obbattu (puran poli/holige), obbattsaaru, maavinakai chitranna (a rice dish made from grated raw mangoes) & kosambri (salad). On the first day ONLY VEG! But that's ok. All I wanted to eat was the Holige & I held the record for eating the maximum number of holiges in one day which was THREE! For those interested in knowing how to make it, here's an illustration!! The second day is when we binged on non-veg & it is called Hosadadku. Oh before i forget here's me with the bangles and the flowers! Looks like you celebrated with a lot of gusto. You look lovely in the sari and bangles, all traditional. Not a bad effort at rangoli either :). 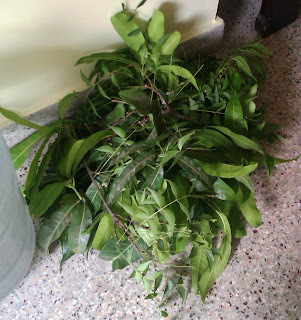 Living in Bangalore, I've been exposed to the enthusiasm with which Ugadi is celebrated. And, only 3 holiges? That's the best you could do :). Enjoyed the post. you know when i wrote about Hosadadku i actually really thought about you & your animal lover post! Where is my holige..?? 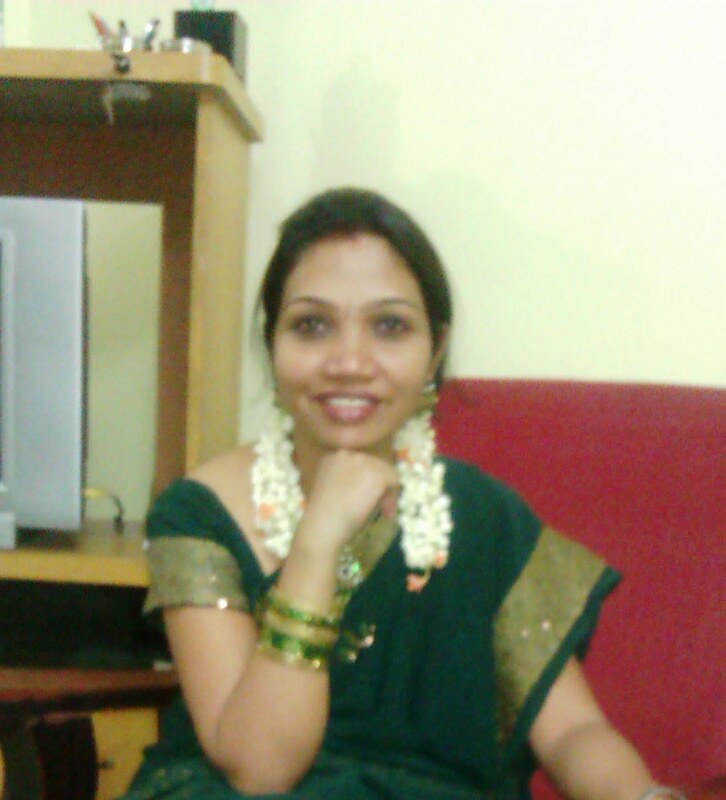 ?hahaha....Is it a new saree, which can tell story of Ugadi 2012...?? I was eagerly waiting for your post on Ugadi to see your wonderful celebrations and know more about the festival and its heritage. And you have given a wonderful rendition of the festival. It was great reading about all the rituals and what they meant in great detail. wow! i would love to celebrate each n every festival with the same enthusiasm n detail as u did! lovely pics too! I was so awaiting this post! Hoilige!!!! Ahh I so want to eat one now. Your sari is beautiful, but I like Tanvi's dress so much more. I am going to stitch one for myself now. And the Rangoli is very pretty :-) And yes I agree it is totally tough. And am so glad, this post has so many photos!! Lovely, totally! hehehhhe yeah me glad too that finally i have a post with some color!! otherwise always boring endless black & white text!!! Tan's dress is actually one of my old saris transformed that way!!! Overall nice post....BTW Happy Belated Ugadi! thank you Sahana... oops...forgot...no saying thank you!! You ans lil Tanvi look gorgeous! And rangoli was really good considering you did it for the first time....The pictures of the temples are very pretty! Nice fun you guys had! yes, we enjoyed all the festivities. thanks Manju for the rangoli compliment ... i am shamelessly fishing for it ...oh the effort that goes into it ... NOW i understand !!! I sent wishes to you on that day, I do not know in the huge fan following of yours my wish got unnoticed I think. yeah was waiting for ur post since u mentioned about your first special ugadi. Nice to know about the things in more depth than I know. pictures of obattu made my mouth watery as it is one of my favourite sweets. remembered my first ugadi and several other ones where my mother in law served me hot ones with full of ghee to me. thank you for sharing the festival with us. Although it was ur first attempt of Rangoon it came excellent . Ur daughter is very cute. Wish god that u have many more festivals with joy. You did it Sujatha :):)I loved your rangoli and the concept of Bevu Bella .Little one looks angelic and you Ati -Sundar in that lovely saree and bangles. Belated Happy Ugadi Sujatha!! The rangoli is great! And nice pics too!! Wishing you all happiness this Nandana Samvatsara. The obattu looks appetizing and you really good. Belated Yugadhi wishes.May the New Year bring you and your family all happiness. The tradition followed is the same on Tamil New year day too with some minor variations. Belated Yugadhi wishes to you and your family. 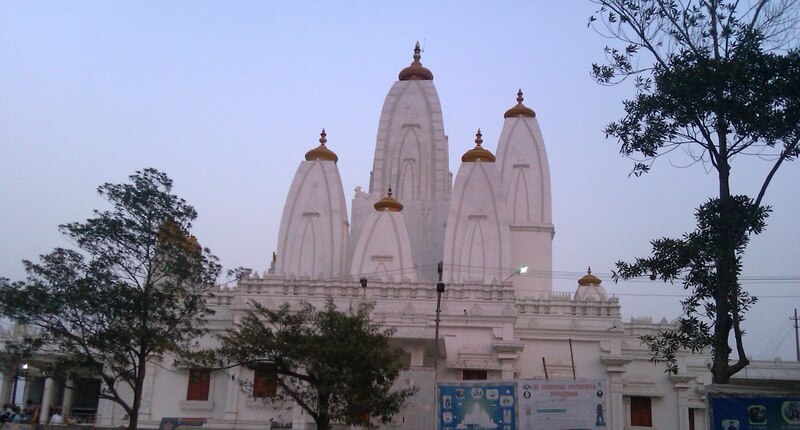 I liked seeing all the pics and the details of Yugadhi. I am from Kerala but I don't know much about this festival. Your post was an eye-opener. yes for Kerala i think it is Onam that is the most important festival. Absolute delight to see such a festive environment being created here on a blog and in reality as well. Great to see that you celebrated in full spirit. you looking very pretty too! You look beautiful, Sujatha! 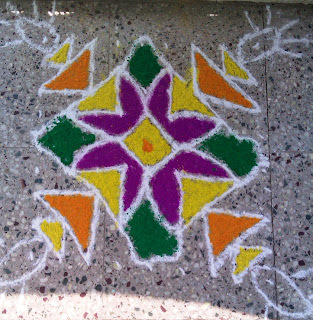 For first time, you rangoli looks good. Tanvi must have enjoyed. Holige looks yummy too! So, the first full-fledged festival is done! All the best for the coming festivals. You are doing good! A nice, grounded to roots, Ugaadi post. 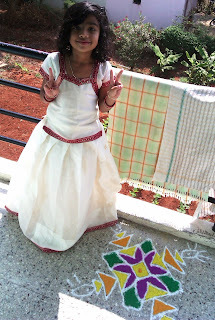 That Rangoli was hard work, wasn't it? I could sense your delight, having completed it. Those pictures greatly compliment the post. oh yaaaa rangoli is BIG time labor! you, tanvi, tasty looking food, celebrations and colors of rangoli..
it was all like perfect things coming together.. Thatz the fun of festivals..
u n tanvi lookin fab !!! I had seen the Ugadi written one calendar but could understand its meaning only after your post. So, thanx for posting about it. From mouth-watering cuisines to lovely rangoli pics and from cherubic Tanvi to stunning Sujatha pics, the post has every essence of Ugadi captured with utter finesse. Anyways,where is papa of Tanvi,you have kept him out of the post,why?... To click pics! hahah papa was busy clicking all the ladies of the house - each one screaming for his attention!! Yuga+Adi=Ugadi and its meaning - that's quite a revelation to me.Now onwards, I think I should be be better able to understand the cultural and religious significance of this beautiful festival. The worship , the Alpana or the Rangoli and the delicacies ( only veg for me please !) you prepare and serve are all nice and wonderful. and last but not the least you look gorgeous ! A very nice post with beautiful pics ! oh you had puran poli for breakfast itself! wow! need I say that both you and ur daughter look beautifulllllllll!! 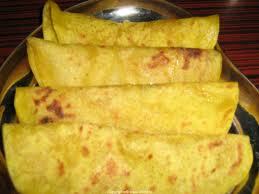 holige is called puran poli in maharashtra and i love it too!! the rangoli looks gr8 too! wish you and ur family a gr8 year ahead!! Sujatha hosavarusha tumba joraage aacharisiddira anta aitu.. You look pretty in the traditional look. Loved you Rangoli. Very good for the first attempt. Obbattu ruchiyaagittu anta photo indaane tiLitaa ide.. 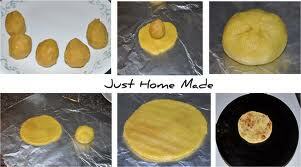 I ate kayi obbattu this time - and I beat you I ate 4 in a day:) Enjoyed your post. This festival signifies the creation of the world. Really, I didnot have any idea about this festival before. Thanx for sharing and pics are great!!!! wow! 4! great ya Ashwini! you look good in natural pose (first 2 pics). So you kept your words!!! Tanvi is very cute :) .. I never knew the meaning of Ugadi or the fact that it's celebrated in north india too! That's good to know! Loved your saree! Happy Belated Ugadi wishes to you and your family. Ahaha Sujatha super ri neevu, chendavagi alankara madkondu ishtu sundravagi mane yella decorate madi, adige madi habba madidiri, Excellent you kept ur promise lovely!!!! keep it up. thanks a lot Ramya :) first time alwa full josh. 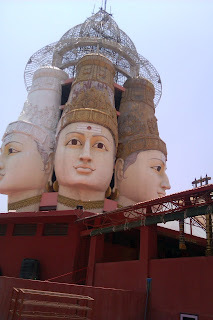 Those two temples are near uttarahalli & RR nagar alwa? Will have to read 'a regret' to know why your first ugaadi came 6 years after your wedding? Great that you gave it all a shot! thank you Juhi :) yeaah i made the rangoli ... finally!!! I stay i j p nagar and i travel to office via uttarahalli everyday. Overall an awesome Ugadhi I suppose....Wish you a belated Happy Ugadi and have a peaceful, happy , prosperous and healthy year ahead !! You made a pretty awesome Rangoli there .Seems like you've had a great time. Just found your blog .Following it. Sujatha - Brilliant!! True to your words you've kept your promise ..The pictures look so nice, looks like you had lots of fun and your daughter looks gorgeous in pattupavada .. Wish u belated Happy Ugadi!! Gangour festival - oh didn't know that. You know so many things on each and every topic! Iam a Rajasthani based in Hyderabad...infact i was born here in hyd....my great grand father came here on invitation of Nawab of Hyd who was keen to develop Hyd as business centre. Comment ಪದಕ್ಕೆ ಕನ್ನಡದಲ್ಲಿ 'ಅನಿಸಿಕೆ / ಪ್ರತಿಕ್ರಿಯೆ / ಅಭಿಪ್ರಾಯ' ಪದಗಳನ್ನು ಉಪಯೋಗಿಸಬಹುದೆಂಬುದು ನನ್ನ ಕಲ್ಪನೆ. 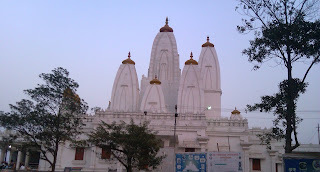 ಸರಿಯಲ್ಲದಿದ್ದರೆ ದಯವಿಟ್ಟು ತಿದ್ದಿರಿ. ನಿಮಗೂ ಕನ್ನಡದಲ್ಲೇ ಬರೆಯಬೇಕು ಎನಿಸಿದರೆ, ದಯವಿಟ್ಟು Google Transliterate (http://www.google.com/transliterate/kannada) ತಂತ್ರಾಂಶ ಉಪಯೋಗಿಸಿ. ನಿಮಗೆ ಸಮಯವಿದ್ದಾಗ ಈ ವಿಷಯವಾಗಿ ನನ್ನ Blog ನಲ್ಲಿ ಬರೆದಿರುವ ಲೇಖನ (http://pacchiee.blogspot.in/2010/05/blog-post_23.html) ಓದಿ. wow to your rangoli and the obattu! and your profile pic is smashing!!! I didnt know much about Ugadi till I read this post..But it is indeed different from the sameday celebration here in maharashta..gudipadwa..! 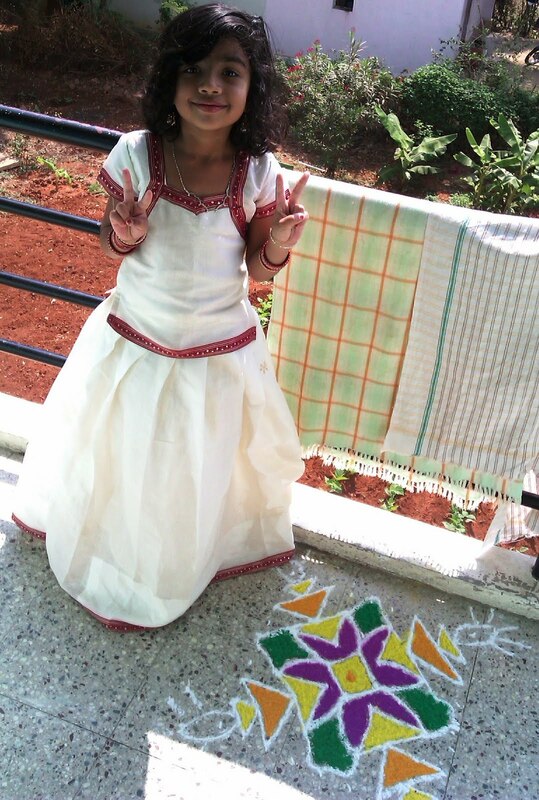 Nice Rangoli..n yeah ur daughter looks pretty cute ! loved her! 100 comments and counting!! a record of sorts..congrats Sujatha! awesome post with nice presentation & lovely cliks..
first time here sujatha..love your space..
will definitely check your space. Ugadi for us in Tamilnadu so far had been just a public holiday. Knowing the meaning of the word and the food that is prepared on that day, etc was good. For Tamilnew year we also prepare Neem Pachchidi- a mixture of neem and Jaggery, idea being the same that you have mentioned. 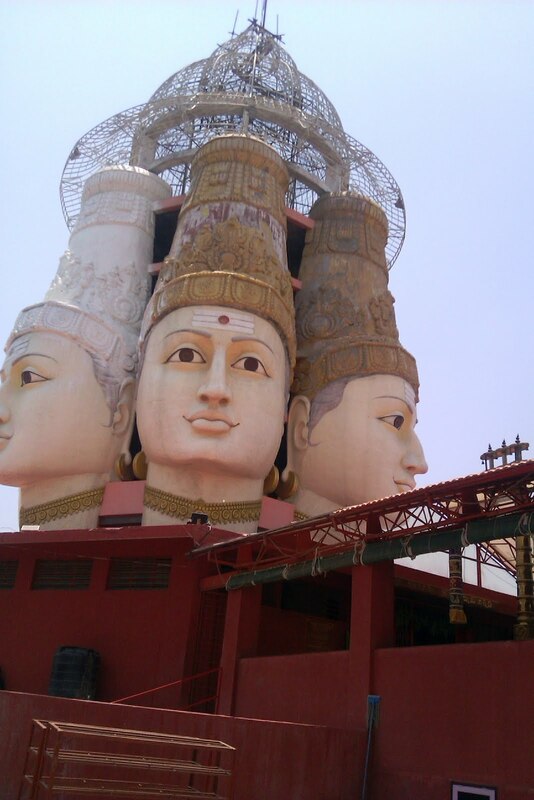 Arumugam temple- does the statue have really 6 faces (all sides together)? Wonderful. yeah Tamils follow the solar calendar, na? 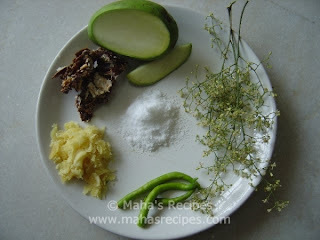 nice post...i did know about ugadi but did not how exactly it is celebrated....now i do!!! Lovely post and that rangoli is very nice. I can't draw a straight line...I was not aware of the details of this festival, looks like a big festival of south. For us, it represents that the harvest is fully grown. We don't celebrate it to that extent. Thanks for sharing and photos are lovely. 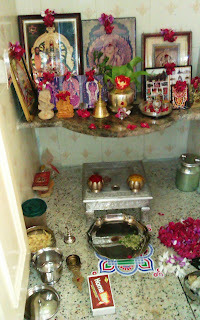 Came to know a lot of information about the significance of a lot of rituals followed during Ugadi. Thanks for visiting my blog, do stay in touch!! Looks like you celebrated Ugadi in traditional fashion.Lot of hard work for you !Great Pics. Here's an award for my favorite blogger - Versatile Blogger! how beautiful!! I like this very very much!! Good to see culture followed at its best. Pooran Poli is one of my favorite dishes. Love it and binge on it each time I go to India. Belated Happy Ugadi. PS - You look lovely in the photos. thanks dear. glad you are back.